One of my favorite Churches in Bohol, the St. Joseph Cathedral. On our second day in Bohol, we toured around the countryside right after mass. We made arrangements with someone we met on Panglao beach, who arranged the tour for us six for only P1500. He was not the driver, but he came along during the whole trip. Note: Photos by me using my S3’s camera and a digicam. These are unedited. This time, we toured primarily around Tagbilaran. This post contains several tidbits I learned from our tour guide. My trip to Bohol definitely proved to me that there are so many things I can still learn outside the classroom. Hurray for lifelong learning! 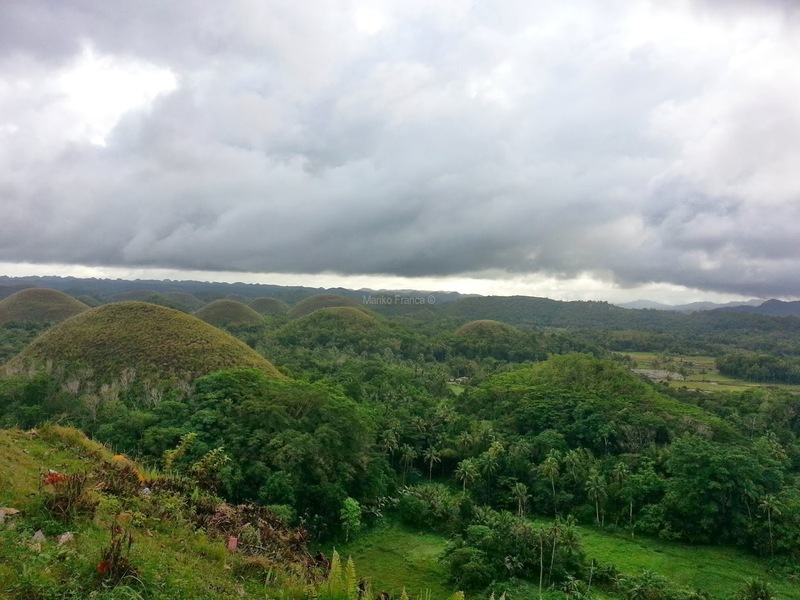 The name Bohol is derived from “galing sa ‘boho’“, which means butas-butas. The land in Bohol is 16% limestone. There is currently a partnership between the local government and a company in Japan who mines some of the limestone in the island. The limestone is shipped to Japan then turned into beautiful plates, and sold, expensively, in the Philippines. The name ‘Tagbilaran’ was from “taguan ng mga Bilaan sa mga pirata,” when our Boholano ancestors used to hide in Tagbilaran’s numerous caves when pirates arrived in the very, very old days. There have been news that say Bohol has sinkholes, but that’s actually just the land collapsing, exposing the numerous caves that populates Tagbilaran underneath. We went to the St. Joseph Cathedral for mass. From our hotel, Dao Diamond, we took a tricycle, which cost us P10/person. The St. Joseph Cathedral was also partly damaged. Several of the walls have cracks, and they have an ongoing fund/support/sponsorship drive in hopes of fixing the Church. 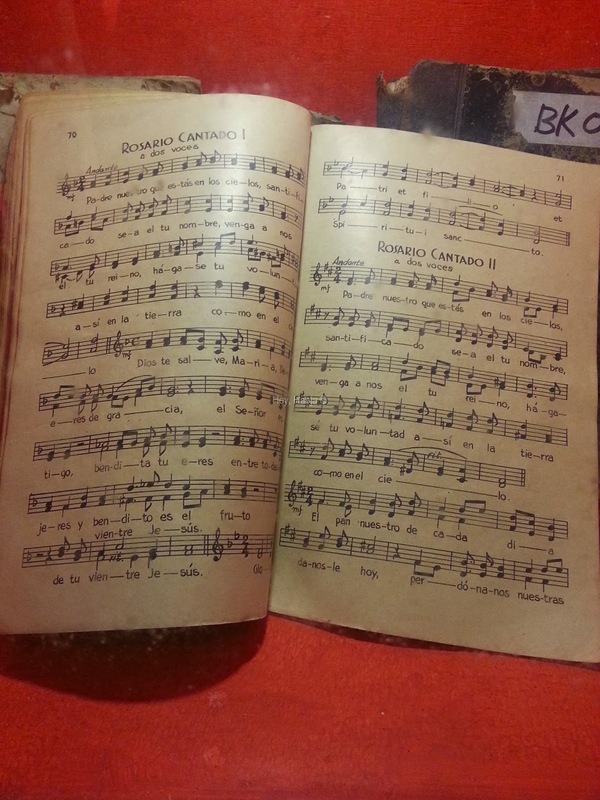 As my mother, sister, and I went to their office to donate for the Church renovation, I wandered around the office and saw various treasures such as this very old songbook in Spanish; a book titled Manual: De Los Parrocos, El Sagrado Ministerio En Filipinas 1880 (1880! ); old bishop’s hat; and old gold cups used for mass. It was very fascinating for a history lover like me. I wasn’t ‘snooping’ around; they were displayed in glass cases for everyone to see and/or appreciate. We passed by the Blood Compact, and I insisted we get our pictures taken. My mom, who has also been to Bohol before, said that the Blood Compact shrine has really improved. The bronze statues are set in a marble platform, when before it was barely noticeable. I think that tableau really set the tone for the Filipino’s inuman pose. I kid. On a serious note, I was happy to finally have seen it because I’ve read and heard so much about the Blood Compact when I was growing up! The ruins of Baclayon Church, Bohol. We passed by another one of the ruined heritages of Bohol, Baclayon Church, and it was both a sad and fascinating experience for me. I was truly sad to see the ruins because they were beautiful churches. At the same time, seeing the ruined structures up close, I was awed by the architectural tricks our ancestors knew that enabled them to build long-lasting structures without the technology that we had today. Our guide told us the builders used egg whites to build these old Churches. I think my mouth hung open at some point. The Baclayon Church is the second oldest church in the Philippines. The Baclayon Church is the oldest church in Bohol. If you look closely at the photo/zoom it, you’ll see a face imprinted on the wall. They say it’s the face of Padre Pio, as stated by one of the priests who had a dream about the saint visiting him and saying it was his face. This is not yet proven, but it is not a painting, and how can anyone imprint a face on a Church just like that? After this awe-inspiring and saddening stop at the Baclayon Church, it was time to have lunch. Our guide brought us to a floating restaurant that was cheaper than the other ‘floating’ restaurants, but the food was pretty okay for about less than P500 or P600 per person. A lot of nationalities joined us on the boat, which had a capacity of about 40 people. We had to sign the manifesto (that brought back so many Camiguin memories! ), then off we went eating our hearts out. Since our group was the first one in the boat, we had first pickings. I think we had three servings each. For the price we paid, we only had one drink free, so we paid for the other drinks we ordered. 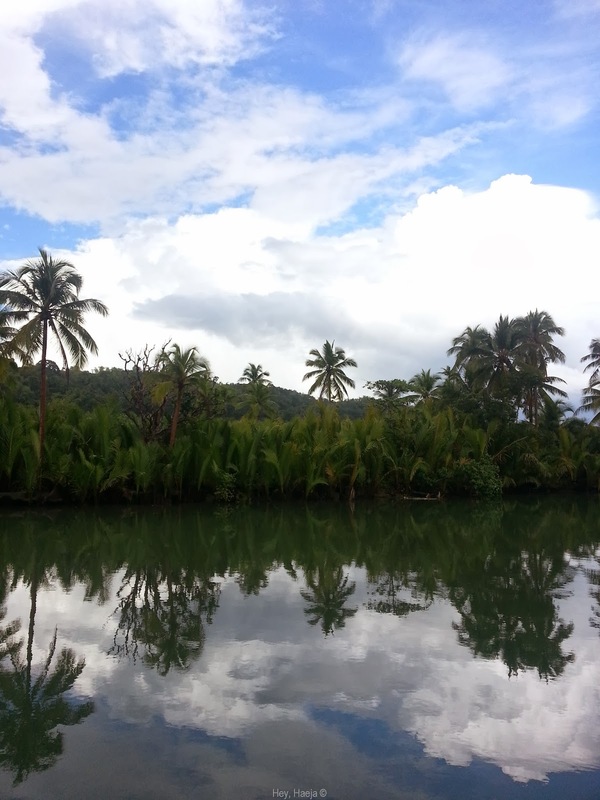 Sky meets Water in Loboc River, Bohol. The boat was filled up with a lot of tourists from different countries. There were Koreans, Chinese, Germans, Americans, and French. I looked up at one of them and said, “Vous etes francais?” I wanted to bop my head at that because I was supposed to say francaise, not francais, cause she was a woman! But she understood my question, and she said, “Oui, oui!” I think she told her family (she’s the mother) because they looked at me and when I greeted them in French, they didn’t look surprised. That’s my first experience with real French people and I just totally failed my first French greeting. Real smooth, Haeja. We were on the boat from 11am until almost 2pm, and it frequently rained during our trip, drenching a lot of us. But when Mr. Sun finally came out and stayed out for about thirty minutes during our boat trip, the view was just one of the most spectacular sights I’ve seen in Bohol. The water reflected the ridiculously gorgeous blue sky. This shot was taken after the thirty-minute downpour, but after the skies cleared it was like the rain never even happened. It was amazing riding the boat and passing through the water which was beautifully reflecting the blue sky. It was also very quiet, and I had a happy tummy, so in that moment, I felt that everything was perfect. Afterwards, we went to the Tarsier Conservation Area. There are 13 tarsiers in the conservatory, but after the earthquake, the world’s smallest primates scampered up the mountain, and only five returned. Since they are nocturnal, almost all of them were asleep. And I’m pretty sure by now they were bored of humans sticking cameras on to their faces. Please, please make sure that your camera’s flash is turned off and that your phone is turned to silent. Don’t scare them away, or make them panic. Since we were on a schedule, I just passed by them quickly. I already had a picture taken with a tarsier way back in 2007, and I am content with that. But my sister, bless her and her patience, stayed behind and waited for her turn to be right in front of one of the tarsiers. And just as she was about to click on the shutter button, the tarsier turned it’s head and stared at her. If you haven’t seen one that’s awake, aside from what you see in postcards, well here it is. Tada! The world’s smallest primate, the Philippine tarsier. Eerie, no? I had the opportunity before to hold a tarsier, or rather it chose to climb up my arm and straight to my shoulder. It didn’t approach anyone else but me and its handler. I will tell you, I felt like I had a baby on my arm. Their hands (paws?) are so incredibly soft, gentle, and smooth. When it scampered on to my shoulder and stayed there was one of my most humbling and feeling honored moments. I mean, this little, panicky primate with baby-like feet chose to hold on to me and wasn’t afraid of me. Gosh. On our way to the Chocolate Hills from the Tarsier Conservation Area, we passed by the man-made forest. When I say passed, I mean our vehicle passed by the place. I wanted to badly to have my photo taken right smack in the middle of the road, but we didn’t stop. Le sigh. Maybe next time? Bohol’s man-made forest was built in the 1970s as a project of Imelda Marcos. The forest is composed of Mahogany trees. One mahogany tree is worth P400,000. They only cut a tree when it is very old, which takes thirty years for it to be considered ‘fully grown’, and they have to plant a mahogany seedling in its place to maintain the forest. The government sells the cut tree for export for furniture. The viewing deck of the Chocolate Hills was almost completely eradicated after the earthquake’s, during the aftershocks. Thankfully, there was enough structure for us to go up the hill. The caretaker of the chocolate hills said he really felt the mountain go up and down since he was cleaning around the place when the earthquake happened. Without the viewing deck, it was hard to take a clear shot of the hills. It looked endless, and just really so beautiful. Are you ready for more interesting tidbits? Hehe. In the 1980s, the first count was only 1268 hills spread across three towns, Pilar, Batuan, and Carmen, but in 2012 another town was considered to fit the criteria, and the hills are now slated to be around 1,794. The name of Chocolate Hills was actually Carmen Hills. This was changed because in the 1980s, a superintendent of Hersheys visited the hills and saw that it was shaped like the Hersheys Kisses, and then it was called Chocolate Hills. The top of the hills are composed of solid limestone. The hills are considered public property and the locals, or anyone, are not allowed to ‘own’ or live in any of the hills (but they may live in the surrounding places or flat lands). 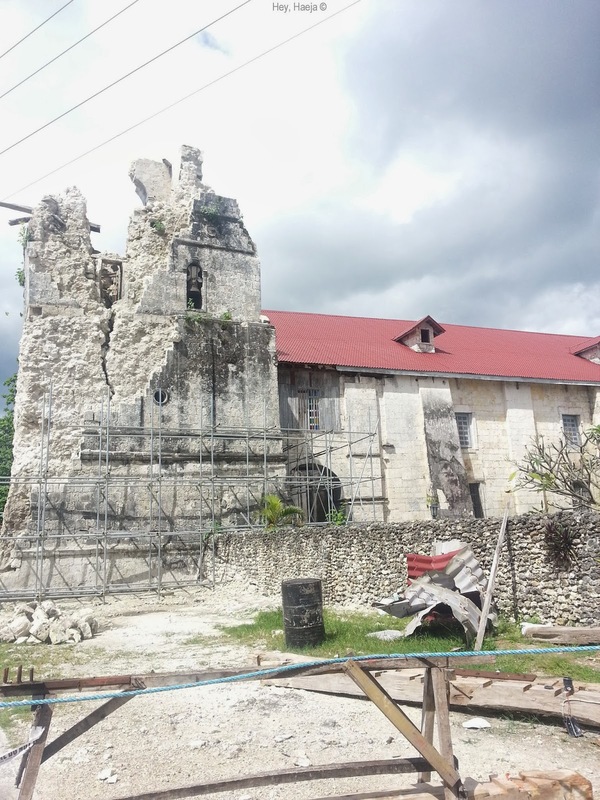 One of our last stop was the St. Peter the Apostle Church ruins, another historical church devastated by the earthquake. I think I visited here the first time I was in Bohol, and it was so lovely. Now it’s pretty much a total wreck. I hope this can be rebuilt, and hopefully with materials that can withstand earthquakes. Ruins of the historical landmark St. Peter the Apostle Church. The part of the ceiling with Jesus’ face holding on to an child saint was left intact. The whole ceiling was pretty much falling apart. It warmed my heart so much. Before we went home, we managed to sneak in a lot of shopping for t-shirts and my favorite, peanut kisses. It’s cheaper if you still go to the new factory of the peanut kisses. It’s in the town, and you just have to ask the tricycle driver to bring you there. The new address of the Peanut Kisses factory is in 5 New Calceta Street, Tagbilaran City. Frankly, there’s only a P10 difference if you buy from them or from the touristy spots, but we still went there to buy their bigger packages. The next day, we walked around the town proper because I wanted to take photos of the capitol building. I saw it on our first day on our way to Panglao, and I thought it looked beautiful. I love the old architecture, they look so regal. The damage to the building by the earthquake is not captured in this photo, but it’s pretty extensive. The Philippine National Hero, Jose Rizal. Across the Capitol Building was a small park where groups of friends, families, or just plain ‘ole lovers hang out. They have a statue of the Philippine National Hero, Jose Rizal, erected smack dab center. In the park are replicas of the Chocolate Hills, a stone tableau, live birds you can feed, and a lot of seating opportunities. I suppose it’s pretty safe because it’s right across the capitol, and there were roving police. We ended up in Bohol’s National Museum, a small, one-floor air conditioned museum in the capitol, across the plaza and St. Joseph Cathedral. There was an entrance fee of P10. For the obvious care put in the display, that’s cheap. There was a huge explanation of how Bohol/Chocolate Hills were formed, and mini replicas of the several heritage Churches in Bohol. There were also displays of some dug-up ancient skeletons, as well as some chinaware that were in pretty good condition. Also on display were the flora and fauna only seen in Bohol. My favorite, though, was a tree trunk carved with the numerous attractions in Bohol. It also made me realize that there was more to Bohol that I had to explore. I want to go back and visit Krus Daku! A 500-year-old Boholana recovered in May 1970. The Bohol Museum needs upkeep of some of the displayed tarpaulins, but it is worth a visit. There was a museum curator, but he was busy with someone, and the two people guarding the exhibit were not able to fully answer my questions. CP Garcia’s desk and chairs. Afterwards, we walked all the way to the Carlos Polestico Garcia’s house called the CPG Heritage House. Carlos P. Garcia is the 8th President of the third Republic of the Philippines, if my memory of our history lessons serve me right. 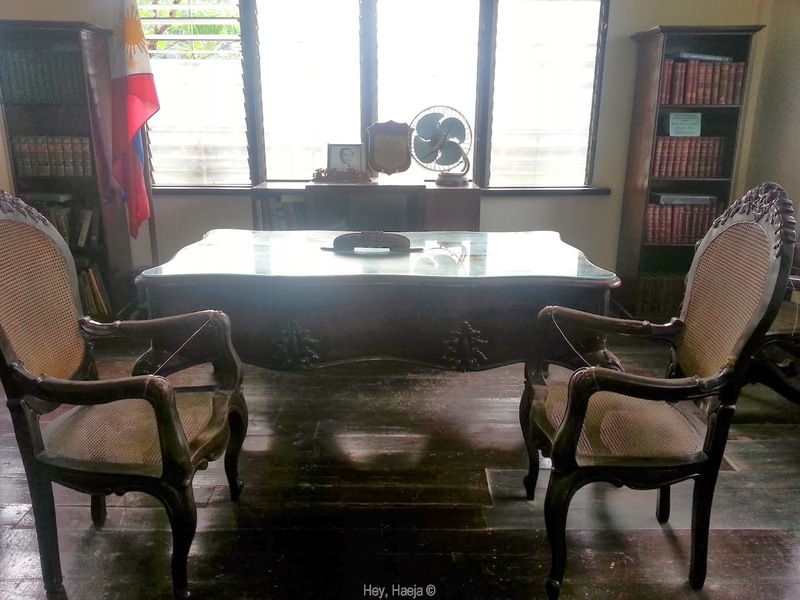 I don’t know if you’re aware that it exists, but yes, there is such a place in Bohol and it is beautifully preserved with a lot of memorabilia from the late president. The house was very modest, and well preserved. The caretaker led us through a tour of the house, and I was so touched by the simple life of Carlos P. Garcia. He was never one of the popular presidents in my mind, but going through his house made me see how humble he had been, and his presidency fascinated me. Afterwards, we had lunch at Garden Cafe, the sister restaurant of our hotel. 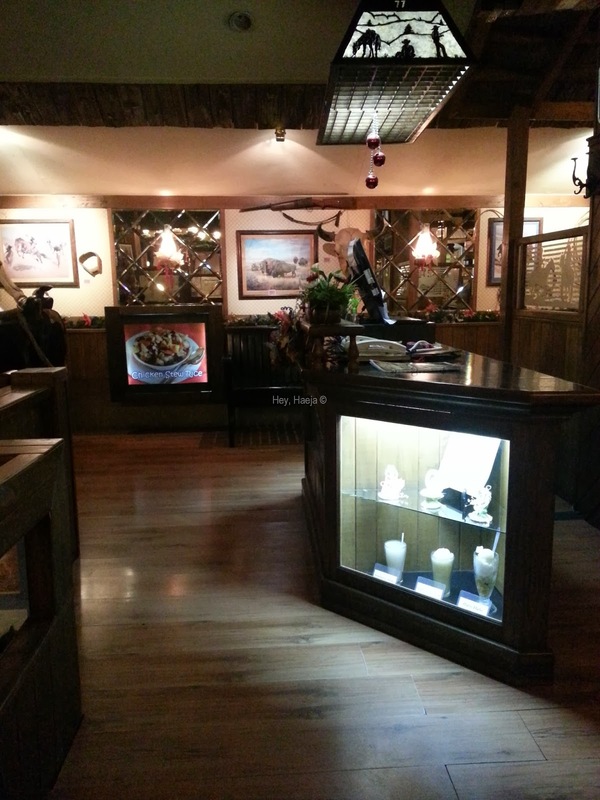 It totally had this cowboy vibe, with the booths, the carriage wheels on the ceiling, and the display of boots on the top of the counter. It seemed popular since the place filled up while we were there for lunch and dinner. 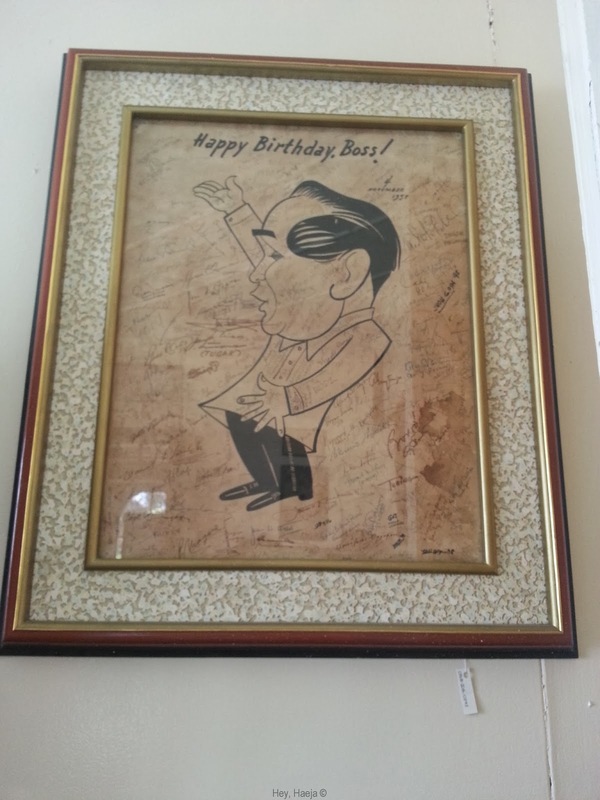 His presidential staff’s gift on his birthday. We then went back to Dao Diamond, where my mom and I spent an hour or two swimming and eating (again). Then my sister joined us and we swam for another hour. Since it was our last night in Bohol, I was itching to go out and see more of Bohol as much as I could. Our dad accompanied me and my sister for a dinner in town, and we went back to Garden Cafe at night. We rode the night shuttle from Dao Diamond and was dropped off at the restaurant itself. The night shuttle cost us P15/person/trip. The dining area on the second floor at night is transformed into this slightly dark, restaurant that gave off a more intimate air for me,but the place had a lot of families and friends out for dinner in town. There’s an inactive bull and horse that you can sit on and use the props for taking photos. Pretty darn cool! The food, in true Dao style, was tasty, cheap, and had huge servings. While we were eating, the lights suddenly turned off. I almost screamed, but I was with my dad and sister, and my awesome phone has a flashlight app, so I just turned on the flashlight coolly as you please, and the three of us resumed eating. The lights went off twice while we were having dinner, and I just kept turning on my flashlight. The people said it was another effect of the earthquake. Sigh, poor Bohol. Afterwards, my dad wanted to find mangoes that weren’t ripened by the use of chemicals, but we searched in vain. 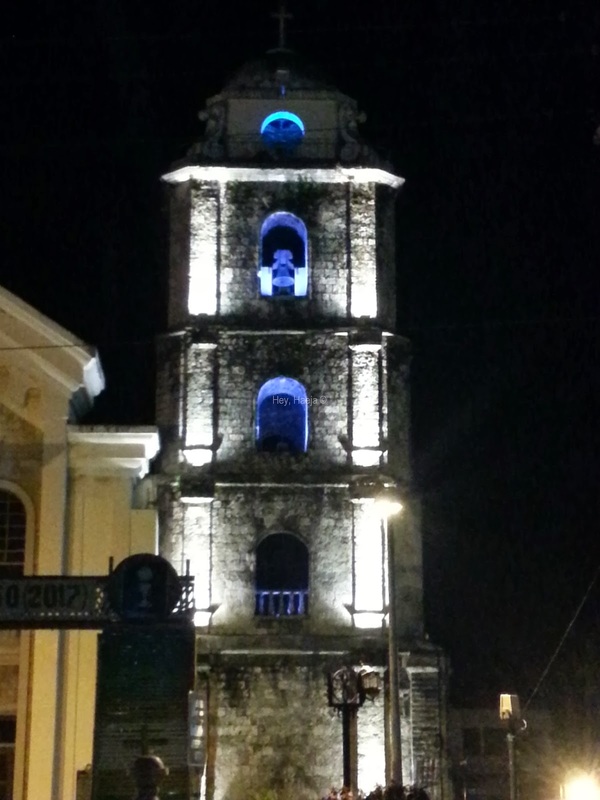 However, I did see the St. Joseph Cathedral’s tower lit up at night, and it took my breath away. The town proper at night was pretty safe to walk around in, and there weren’t many beggars asking for handouts. Also, they said it’s relatively safe in Bohol, but I still found myself holding on tight to my sister. Heh. Scaredy-cat. The next day, we just had breakfast and went to the airport for our morning flight. So endeth my wonderful vacation to Bohol. It is definitely one of the trips I’ll treasure for a lifetime. Without my planning to, I stumbled upon one of the best history lessons I’ve ever had. Bohol felt like both a visit to the past, and a way of moving forward, and definitely what I needed at the time. Thank you, Lord, for the wonderful Bohol!